This year we are asking ABA bookstore members to OPT-IN to receive a Banned Books Week kit! Request forms must be submitted by Thursday, June 7! Banned Books Week 2018, the annual celebration of the freedom to read, will be held September 23 - 29. Banned Books Week kits will be sent to bookstores by request only! 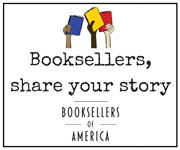 ABA member bookstores must complete this form to receive a Banned Books Week kit. Kits will include bookmarks, stickers, caution tape, a counter card, and more. Supplies are limited and will be fulfilled on a first-come, first-served basis. We ask that each bookstore branch fill out this form to receive a Banned Books Week kit. Kits will be included in the August Red Box. If your store does not participate in the Red Box program it will be shipped via USPS.